A newly updated roof has the power to improve your home value. But did you know that specific roofing materials such as metal have the potential to exponentially improve your home value? Metal roofs have been around for a long time, and they’re finally starting to gain popularity for residential homes. In a 2017 survey by Roofing Contractors, metal roofs were ranked as the third most-popular roofing material, and their 2018 survey stated that roofing contractors are anticipating a 69% increase in sales for metal roofs. 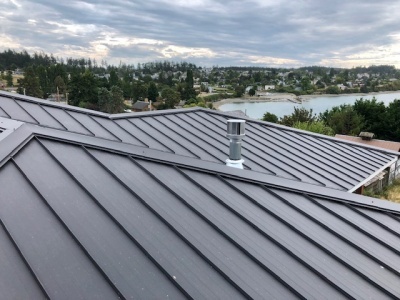 The three types of metal roofing material we’ll cover in this article have their own features and benefits that make them stand apart from one another. However, one thing remains common: they will all help improve your home’s value. The biggest reason why metal roofs increase your home value more than asphalt shingles is because metal roofs are known for their durability and longevity. Asphalt shingles have an average lifespan of up to 25 years, while metal roofs can last up to 50 years, sometimes more. To put it into perspective: a homeowner is more likely to replace an asphalt shingle roof two times before they replace one metal roof. In addition, metal roofs can withstand some of the harshest weather that Mother Nature can throw at the Pacific Northwest, helping to reduce the need to repair or replace metal roofs. Includes 24- and 26-gauge G90 galvanized steel construction, making it 50% stronger than the industry standard. Withstands winds up to 110 MPH. Includes 30-gauge G90 galvanized steel construction, making it 50% stronger than the industry standard. Includes 26-gauge G90 galvanized steel construction, making it 50% stronger than the industry standard. What does this all mean? In the Pacific Northwest, we see high-wind storms from time to time, and those high winds can uproot both trees and roofs. Having a roof that’s able to withstand these high winds prevents having to repair or replace a roof after the storm. In addition, bare steel is prone to rust when exposed, and the risk for rust is heightened by the Pacific Northwest’s moist environment. Galvanized steel, like that which is used on all of State Roofing’s metal roofing products, is steel that has been coated with zinc to protect the metal from rust. The zinc blocks moisture and oxygen from reaching the bare steel, thus preserving the integrity and protecting against corrosion of your metal roof through the year-round wet weather. The durability of a metal roof will help improve a home’s value in the sense that homeowners don’t have to worry about replacing their roof every 20 years like they would with asphalt shingles. Another aspect that improves home value is a maintenance-free roof. When it comes to showing a home to a prospective buyer, having a roof that’s in tip-top shape is vital. If homebuyers see any dents, cracks, splits, or blemish of any sort, there’s a good chance that they’ll request a discount on the home due to the roof’s defects—whether big or small. The three different metal roofs we offer here at State Roofing are all finished with Kynar 500 and SMP finishes. This creates a surface that won’t crack, split, or break—essentially creating a virtually maintenance-free roofing material. How does this help improve a home’s value? Kynar 500 is a resin-based coating that helps preserve the integrity of galvanized steel. The coating also withstands moisture, UV rays, and other atmospheric pollutants that would otherwise corrode the metal roof. Along with those benefits, Kynar 500 also provides a unique finish that allows the roof to retain its color and gloss over time, upholding the aesthetics of the roof. This means that homeowners don’t have to worry about fading roofs. Metal roofs are a hassle-free option for homeowners as they’re impervious to damage caused by algae and moss because they don’t retain moisture. The varying weather in the Pacific Northwest, where one day it could be pouring rain and the next it could be perfectly sunny, makes it a harsh environment for traditional roofing materials, such as asphalt shingles, to survive in. Metal roofs help promote energy efficiency in that they’re able to reflect solar radiation instead of absorbing the heat. This does wonders during the warmer months as homeowners could see savings up to 40% for air-conditioning costs, according to the Metal Roofing Alliance. In addition, the ultimate way to drive energy efficiency in your home is to install solar panels. At State Roofing, our standing seam allows for solar panels to be easily snapped right into place. This eliminates the need to penetrate the roof, reducing the risk for potential leaks. Being able to save money on air-conditioning costs and reduce the risk of leaks from solar panels are appealing factors to potential buyers, helping to increase your home’s values in their eyes. Metal roofs are an ideal option if you’re looking to improve your home value. At State Roofing, we offer three different metal roofs: standing seam, ironwood, and metal shake. Each of these metal roofs has incredible durability, featuring galvanized steel construction that makes them 50% stronger than the industry standard that also allows them to withstand high winds. 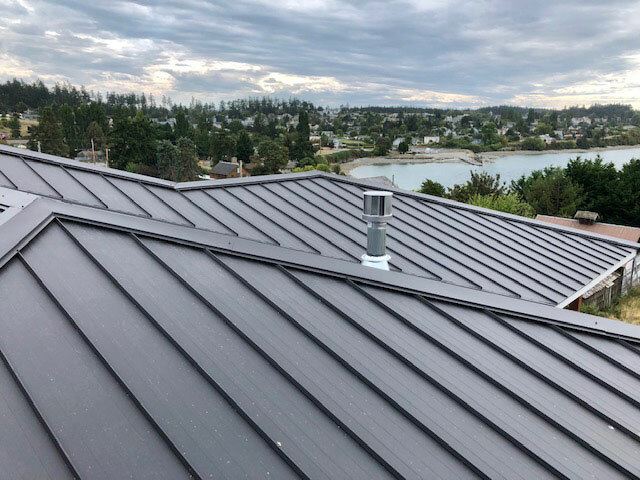 Metal roofs are also ideal for the Pacific Northwest since they’re maintenance-free in that they don’t retain moisture, preventing moss and algae from growing. Last but not least, metal roofs promote energy efficiency. 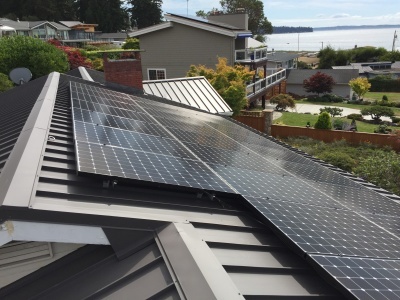 Specifically, the standing seam allows solar panels to be easily snapped on, minimizing penetration risk and reducing the potential for leaks. Want more details on how our metal roofing materials improve home value? Whether you’re in Seattle, Olympia, Bellevue, Snohomish, or the surrounding areas, give us a call at (360) 205-3100 or fill out our contact form to get your questions answered or to request a free estimate.